Chemical Guys Slick Finish Cleaner Wax is the perfect wax to clean and protect any color vehicle. The natural Brazilian carnauba wax creates a brilliant shine and provides durable long-lasting protection. The cream wax is formulated with advanced micro-abrasives that clean paintwork and remove light swirls, stains, and imperfections. Slick Finish Cleaner Wax restores the original beauty to any color paintwork. The cream wax formula cleans and protects in just one easy step. Micro-abrasives and cleaners easily remove oxidation, minor imperfections, and light swirls in seconds. Slick Finish Cleaner Wax is safe for clear coat and conventional single-stage paintwork. Brazilian carnauba wax protects the surface with long-lasting durability, and optical gloss enhancers reveal impressive shine and color. Slick Finish Cleaner Wax repels water, dirt, pollution, brake dust, and stains. Easily apply by hand or machine to achieve a super slick shine. Apply a second coat to protect and enhance any car, truck, motorcycle, or RV. The innovative cleaner wax eliminates multiple detailing steps with just one product. The versatile formula enhances and protects glass, metal, and painted surfaces against staining, spotting, and pollution. 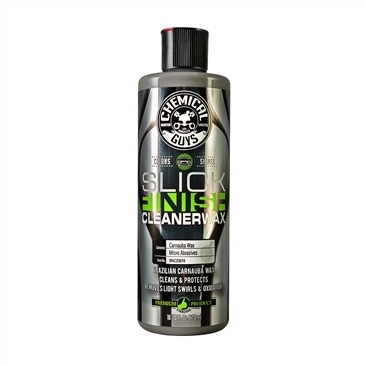 Give your car a show winning shine in less time with Chemical Guys Slick Finish Cleaner Wax. Carnauba wax cleans as it protects. The natural wax is secreted by a palm tree that grows in the rainforests of Brazil, and protects the fragile leaves against harsh sunlight and extreme weather. Scraping the waxy flakes off the leaves and processing produces a luxurious cream that easily spreads over paintwork, polished metals, and clear glass and plastic car parts. Natural oils help break down and emulsify impurities, surface stains, and contamination stuck onto automotive surfaces. Slick Finish Cleaner Wax is blended with high carnauba content, natural paint cleansers, and light abrasives to help restore a new lustrous shine to automotive paintwork and polished surfaces. Use Slick Finish Cleaner Wax to restore lightly faded, stained, and dull paintwork with a brilliant shine. Natural carnauba wax is known for its warm wet shine. Car enthusiasts, professional detailers, and show car preppers have turned to carnauba wax for over 100 years. Slick Finish Cleaner Wax continues the refined pedigree of natural carnauba wax and adds enhanced cleaning and correction capabilities not found in any other wax. Slick Finish removes light surface stains, swirls and scratches, hazing, and oxidation to reveal a deep lustrous shine. The high carnauba content enhances a warm shine that looks dripping wet. Freshly-waxed cars look like they were just painted. Clean, protect, and enhance any glossy painted surface with Chemical Guys Slick Finish Cleaner Wax. Car wax does more than just shine: it protects. Detailers and enthusiasts don’t wax cars to make them shiny;they wax cars to seal and protect them from damaging environmental contamination, harsh UV sunlight, and spots from water, bird, and insects. Clean paint may feel smooth to the touch, but under a microscope, it’s clear to see how porous paint really is. Contamination, dirt, and microscopic particles like brake dust and rail dust stick inside these pores and cause corrosion, paint failure, and a rough feel under the hand. Removing these contaminants with a clay bar restores a smooth feel, and sealing the pores up with natural carnauba wax prevents future contaminants from sticking to the paint; they just slide right off the slick waxy surface. Don’t just make a vehicle shine: protect it from future damage with Chemical Guys Slick Finish Cleaner Wax. Pour a small amount onto a foam or microfiber applicator pad. Allow Slick Finish Cleaner Wax to bond with surfaces for 15 minutes. Buff off with a premium microfiber towel for a brilliant shine. Spread Slick Finish Cleaner Wax with a dual action polisher using a clean finishing foam pad.